Kendall Wright: Does Size Matter? As you can see, it’s not exactly a list littered with future Hall Of Famers. In fact, most of those guys are considered to be huge disappointments. In the same time span, there were 58 6’0+ WR’s selected in the top 20. As with the first list, the bulk of these guys were drafted before 2000. Between 2000-2011 there were 48 WR’s selected in the 1st round, only 9 of whom (18.8%) were shorter than 6’0. While smaller, more agile WR’s are becoming en vogue (e.g. Antonio Brown, DeSean Jackson) and increasingly coveted, the league’s drafting tendencies haven’t caught up to the trend quite yet. 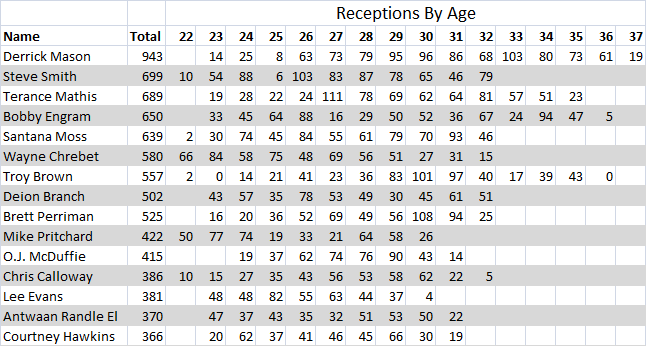 Despite the success of recent draftees like Brown and Jackson, the league is still dominated by 6’0 or taller receivers. In 2011, there were 184 wide receivers who caught at least one pass – 130 (70.6%) of whom were 6’0 or taller. In total, there were 5884 passes caught by WR’s league-wide. Only 1510 (25.6%) of those receptions came from WR’s shorter than 6’0. Of the 1089 Games Started by WR’s, only 231 (21.2%) were by < 6’0 receivers. All of this is not to suggest that shorter receivers can’t succeed or that Wright has a higher chance of busting than a taller receiver would. After all, two of the game’s best receivers are shorter than Wright’s listed height: Carolina’s Steve Smith and New England’s Wes Welker. Unlike Wright, neither of those guys were highly regarded coming out of school. Smith was a 3rd round pick of the Panthers, and Welker was an undrafted free agent signed by the Chargers. That said, there is some reason to think that while he is rumored to be shooting up draft boards, the chances are slim that Wright’s draft stock rises above the middle of the first round.